Connect with the empowering angel message and healing frequency of Archangel Michael to Inspire Creative Change in your life. Archangel Michael lovingly connects you with Divine frequency, and healing energy to rejuvenate and empower you in the present moment, helping you to claim your creative ability to manifest blessings. Simply breathe, relax, and listen to connect with Archangel Michael in this free angel message .MP3 channeled by Melanie Beckler and set to the beautiful meditative music of Thaddeus. This angel message with Archangel Michael has been transcribed into text as well, which you can access below. 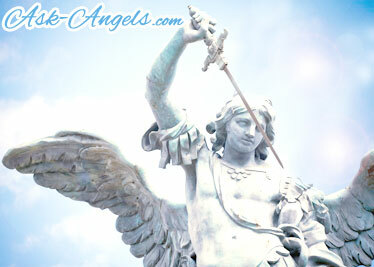 Dear one, indeed I am Archangel Michael, present here and now. Present with you in this very moment, to assist you, to uplift you, to inspire you to cocreate positive change in your life for the time for this, indeed, is now. You are the one with the power in the present moment to make these changes. But know that you are loved and assisted through all of this. You are supported by powerful beings beyond the veil. You are supported by all of creation and the entire universe, and by shifting your point of perspective, you are able to tune into the support and invite it into your experience. With a shift in perspective you will then be able to see the love and presence of your angels around you often and always. You will feel and know the love of the divine in all areas of your life. You will be able to recognize all that you have to be grateful for and claim your power to manifest more of that which you love, which you are thankful for, which inspires and excites you and serves all life, all consciousness, and all that is. At this time imagine a giant orb of white light forming around you, a cleanse of divine healing, a cleanse of divine light dissolving away remnants from this past cycle of manifestation and expression. Densities and challenges you’ve experienced throughout your life, residue, and debris which may be present in your auric or etheric body such as tension, stress, and cluttter of the ego mind are cleansed and purified. This orb surrounds your mind, body, and spirit, soothing your emotions, uplifting your vibration, and inspiring your creative potential. For indeed, this is the shift in perspective that aligns you with being able to create all that you desire in your life within this new energy. Creation, creativity, personal expression, giving value through what you create mentally, emotionally, spiritually, physically… Will propel you forward more powerfully, more rapidly, and towards more fulfillment than the outdated paradigm of consuming could ever inspire. When you want more abundance in your life, when you want more, shift your thinking not to how can something outside of you align this into your being, but how can you create more, give more, offer more value to the world, to humanity, and to the collective. For in offering this value and creating something that benefits all, you are rewarded with all the abundance you would ever want and seek. Creating is your birthright as a spiritual being in human form. Creating is essential to align with the fulfillment you seek in this life, for creating is the path of growth. Creation requires you to put yourself out there, to push beyond your ego, which says you cannot, to follow the promptings of your heart and your intuition, to manifest your creative potential and your ideas into being. Creating and being creative speaks not at all and not only to painting or being an artist, or expressing in this way. It is fine if you do these things, if these stir the passions of your heart and this is what inspires you, but there is much more to the creation process. There is much more to being creative. Being a creator speaks to the creative process present within all avenues of life, all colors and shades and facets of expression. Through present moment awareness you are able to understand and experience that which brings you passion and fulfillment. Your joy and your love and your passion, act as a guidance system in this life, aligning you with areas to create within. Areas which will serve all, which will reward you, which will empower others, which will hold value for the present time, for the collective consciousness, for humanity, for all beings. Creation is a huge and important part of what you are here in life to experience and to share. Not to sit back and watch life, though this is part of what you are here to do as well, to observe, but you are meant to interact. And if you have not been feeling fulfilled, we ask you now, have you been creating? Start creating in a small way, creating beauty within your home, creating beauty within your life, and then think upon how you can expand this to create blessings in the lives of others and when you shift your perspective in this way all the goodness that you bring into the lives of others ripples out and is mirrored back so that the infinite blessings of the divine align with your being. This is not by sheer chance but by divine design. Abundance and goodness and love mirrored back. What you broadcast out, what you create, and what you contribute, you receive back. And so right now within this orb of light, let yourself release the blocks and limitations which have kept you in fear. Release the doubts and fears which have kept you from creating and expressing and giving and contributing in a way that inspires and empowers you, in a way that serves all, in a way that brings value, ensuring that you are taken care of and that within the field of collective consciousness of all that is, your contribution, you presence, your life is making a difference. Do not worry about creating on a grand scale. This will come. Start small. Know that your creation process spans lifetimes, and so you’re building upon the skills and resources you have developed in the past. You are building on lessons and objectives and creations across time. This is why you need not change the world in a drastic way now, just create, following your heart, following your divine inspirations, building up your light, your creativity, your intuition and remembering the gifts, abilities, skills of your soul which empower your personal creations further. With love in your heart and with gratitude upon your mind, synchronicity, the magic held within time, and empowered by the assistance of your angels will align you with the right people, the right places, the right opportunities to then cocreate, to serve, to love, and to make a difference. Create, for you are a creative being, a seed of the divine, the grand creator and you are present in physical form to hone this ability. Your time to begin, to get started, to move further along this path is now. You are cleansed and uplifted. Light frequency rejuvenates, purifies, and inspires your being. You are so loved, you are blessed, you are uplifted. All cords which are draining your power, your focus, and your priorities are cut and released. Your power, your creativity rewoven into your being. Feel your power return, your authentic voice build. Act, create, live, for the point of power is in the present moment and your time is now. You are so loved, blessed, and uplifted. Goodbye for now. Beautiful message. Very inspirational. Many blessings to you. Thank you so much for bringing forth these powerful and truly encouraging messages. They really help me to move through some of the challenges which the current energy brings up for me in my life. Namaste! And so it is manifested in my life here and now. Amen.